Apple Music rocks—but it's also hard on the eyes of the visually impaired, explains Steven Aquino. We’ve all seen Apple Music take a beating on Twitter now and then, but I actually like it a lot. Prior to jumping on the Apple Music bandwagon, I was a happy Rdio subscriber of a few years. Rdio had many great qualities, like a beautiful design and a focus on albums, which I prefer. It wasn’t the most visually accessible app, but Rdio got me to fall in love with the “all-you-can-eat” model of streaming services after years of buying albums a la carte. My allegiance to Rdio came to a swift end the moment Apple flipped the switch on Apple Music at the end of June. I cancelled my Rdio subscription (apparently I wasn’t alone—the service eventually went belly-up) to go all-in on Apple Music, and I haven’t looked back. In my experience, Apple Music gives me much of what I appreciated about Rdio, just with a much bigger catalog, plus little extras like Beats 1 and the For You section. Unfortunately, Apple Music is also similar to Rdio in that it isn’t the most visually accessible app. At times I find Apple Music difficult to navigate, due to the cluttered interface and small labels and controls. While none of these issues is severe enough to be a deal breaker, as a group they hamer the experience and are worth examining from an accessibility point of view. The biggest problem I have using Apple Music is getting around. Apple decided to integrate Apple Music into iOS’s Music app, but I’m not convinced that was the best approach. There’s just so much going on in Apple Music—buttons everywhere!—that it makes it hard for me to find things. My eyes are constantly moving (and straining) to find a button or option. 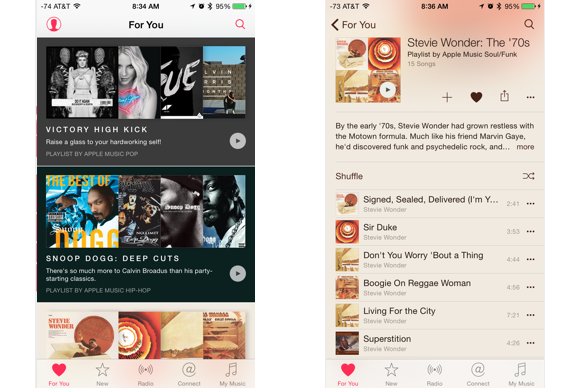 Apple Music launched on iOS 8.4 (left), which was very cluttered. The interface got cleaned up in iOS 9 (right), but it’s still hard for me to read, especially those tiny tappable targets up top. From an accessibility perspective, this is troublesome for people like myself who suffer from low vision. The more content an app puts onscreen, the harder it becomes to focus my eyes on what I want. Constantly moving my eyes to find what I’m looking for is tiring, and ultimately worsens the experience. Apple Music’s UI is chock-full of buttons, drop-down menus, and buttons that look like words—it has so much going on, it’s visually overwhelming. 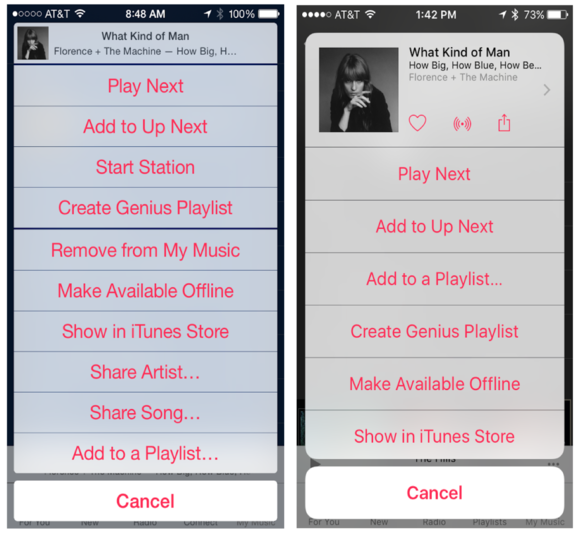 I’m not a UI designer, but one potential fix could be to make Apple Music a standalone app. I think a big part of my problem in getting around is that Apple effectively bolted the streaming service onto the legacy music stuff. There’s no clear indication that this here is streaming and that over there is purchased, for instance. It’s a mash of old and new, and I increasingly feel that Apple should’ve made a clean break by giving Apple Music its own standalone app, even if it coexists alongside the mashup app that shows everything at once. Compounding the complexities of its user interface, Apple Music has another problem: small fonts and iconography. There are places all over Apple Music where I wish text would be bigger and more legible. One example is editors’ notes. I often browse the For You section, as I think it does a great job at recommending music and compiling playlists. The problem is that the notes that preface a playlist or album are set in a font that’s way too small to read comfortably. Alas, pinch-to-zoom doesn’t work anywhere in Apple Music, so I’m unable to read these notes without squinting mightily. The editors’ notes in the For You tab are unreadable for me. I realize I could turn on Zoom when I want to read, but that’s beside the point. I should be able to use a system-level gesture like pinch-to-zoom to access information, and it’s frustrating that I can’t. Another issue that affects reading text is contrast. For as nice-looking as Apple Music is, it does suffer from its form trumping its function. A prime example of this is the Now Playing screen. Similar to Rdio, Apple Music takes the colors from the album art and applies them to a blur in the background. It’s a neat trick, but the issue is sometimes the colors clash with the text, making for terrible contrast. At this point, I’m faced with a double-whammy for visually impaired users: small text and low contrast. I would like to see Apple add an option to remove the blur from the background, akin to the Reduce Transparency setting in Accessibility. As nice as the effect is, it does me no good if I can’t see which song is playing. In this way, I think a simple black-on-white look would be better. Apple Music does support Large Dynamic Type, but in my tests, it doesn’t apply to all text, and didn’t fix my gripe about editors’ notes. And it isn’t just text that needs a size boost; Apple would also do well by increasing the size of buttons across the app. They’re small everywhere, but especially controls like Shuffle, Repeat, and More on the Now Playing screen. Apple Music has still made me a fan despite of these issues, and there are two things in particular that I enjoy. First is 3D Touch on the iPhone 6s. I like how I’m able to use Quick Actions on the Home screen to quickly start playing Beats 1 or see which song I last played, saving me multiple taps inside the app. It may sound trivial, but these subtle changes make a big difference to someone like me who has both visual and physical motor impairments. 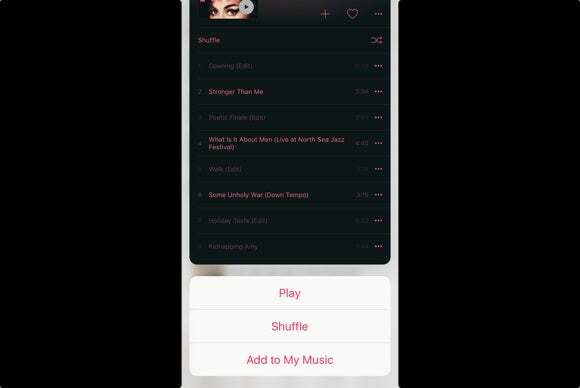 Peek & Pop and the 3D Touch Quick Actions make Apple Music a lot easier to use on an iPhone 6s or 6s Plus. This concept also applies to Peek & Pop in Apple Music. I love how I can force-press on a playlist or album and get a peek at its contents. Then I can press a little harder to pop into that full screen if it interests me. Like with the Quick Action, Peek & Pop saves my eyes and finger from extra work, and both really speak to the usefulness of the 3D Touch gesture. Secondly, I very much enjoy Apple Music on my iPad Air. Most of this is due to the sheer size of the iPad’s screen, but I also prefer the interface on the larger canvas. Album art is bigger, playlists are bigger, and even the editors’ notes are (somewhat) more readable on the 9.7-inch screen. 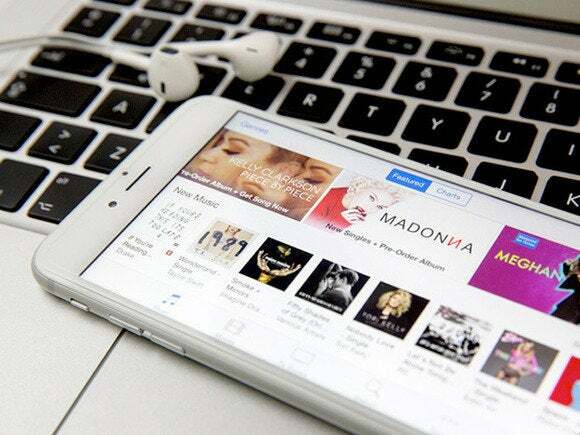 While Apple Music is an imperfect product, I’m sticking with it. None of its accessibility problems has been enough to keep me from using the app, and I enjoy the service as a whole. I still hope Apple might address the issues I raise here, but in the meantime, I will happily continue as an Apple Music user, warts and all.